Expedition 13 flight engineer Jeff Williams (lower left) and station commander Pavel Vinogradov work with the Strela hand-operated crane. TheInternational Space Station (ISS) has a new camera eye and a once-more completeoxygen generator system after an extra-long spacewalk by its two-astronaut crew. ISS Expedition13 commander PavelVinogradov and flight engineer JeffreyWilliams spent six hours and 31 minutes making repairs and collectingexperiments along the space station's exterior. Their excursion lasted almostan hour longer thanplanned after the astronauts fell behind in their work schedule. 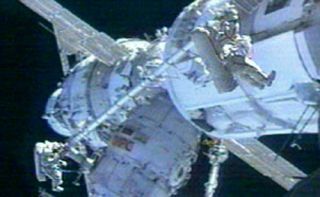 But theextra time, 31 minutes more than typical spacewalks in Russian-built Orlanspacesuits, allowed the astronauts to replace a faulty camera on the station'sMobile Base System railcar. The task was a late addition to the spacewalk lineupand was almost cancelled due to today's time crunch. Vinogradovand Williams began their extended spacewalk at 6:48 p.m. EDT (2248 GMT), whenthey stepped outside the station's Russian-built Pirs docking compartment whileflying 220 miles over Southern Asia. "Here I amhanging by a tether by the Pacific Ocean," Vinogradov said during thespacewalk. "It's like a fairy tale." TheExpedition 13 crew made crucial repairs to several station systems, but at someloss. During thespacewalk, Vinogradov watched a foot restraint adapter, which had previouslylinked him to the station's Strela crane, drift off into space. "That'sbad," Vinogradov said as the cylindrical adapter flew beyond the spacestation's solar arrays. But NASAofficials said the errant adapter is believed to have drifted out of the spacestation's orbital plane and will not pose a debris risk to the ISS at thistime. TheExpedition 13 crew made two key ISS repairs during today's spacewalk. Vinogradovreplaced a clogged vent nozzle used to dump excess hydrogen overboard by thespace station's Elektronoxygen generator - the primary oxygen producer aboard the orbitallaboratory. TheElektron device separates water into oxygen and hydrogen through electrolysis,but has had a finicky track record since an electrolyteleak contaminated its hydrogen vent last year. The leak rendered the ventunusable, and forced engineers to reroute the Elektron's hydrogen waste throughan alternate route that led to routine downtime for the generator. NASAspokesperson Rob Navias said that, with its hydrogen vent system once againfunctional, the Elektron oxygen generator will be reactivated on Monday. Vinogradov and Williamsalso replaced a broken video camera that provides key views from the spacestation's railcar-like Mobile Base System, which is used to haul the outpost'srobotic arm along its main truss segment. The camera will provide akey backup to other views during STS-115, NASA's next shuttle flight to flyafter the planned Julylaunch of STS-121, when spacewalking astronauts will install new solararrays outside the ISS, the space agency said. In other tasks, Williams retrievedan exposure experiment and the last of three Russian Biorisk containersdesigned to study microorganisms that have been subjected to the weightlessnessof space. Two other Biorisk canisters were recovered in previous spacewalks. Vinogradov collected ametal plate dubbed Kromka, which ISS engineers will use to study the effect ofthruster firings on the space station structure. He also photographed anavigation antenna on the aft end of the station's Zvezda service module, whichmay be interfering with a nearby thruster, and repositioned a similar antennato avoid signal disruption from an errant cable. The antennas will help afuture European cargo ship make unmanned deliveries to the ISS. The busy spacewalk is thefirst of two planned spacewalks for the Expedition 13 crew. Williams is expected to dona U.S. spacesuit and work outside the ISS later this summer with Europeanastronaut Thomas Reiter, who is slated to join the Expedition 13 crew when thespace shuttle Discovery visits the station in July. Thespacewalk also marked the 65th spacewalk outside the ISS. It was thesecond career spacewalk for Williams and the sixth for Vinogradov, who stillmarveled at some of the excursion's simple tasks despite his experience. "This is somethingI've never done before, I'm wiping my hands in space," Vinogradov said ashe brushed his spacesuit clean after one task. "I always say wipe yourhands."